For this guide using Hue is Query Tool With GUI For Browsing, Querying, Visualizing Data & Developing Apps for Hadoop. 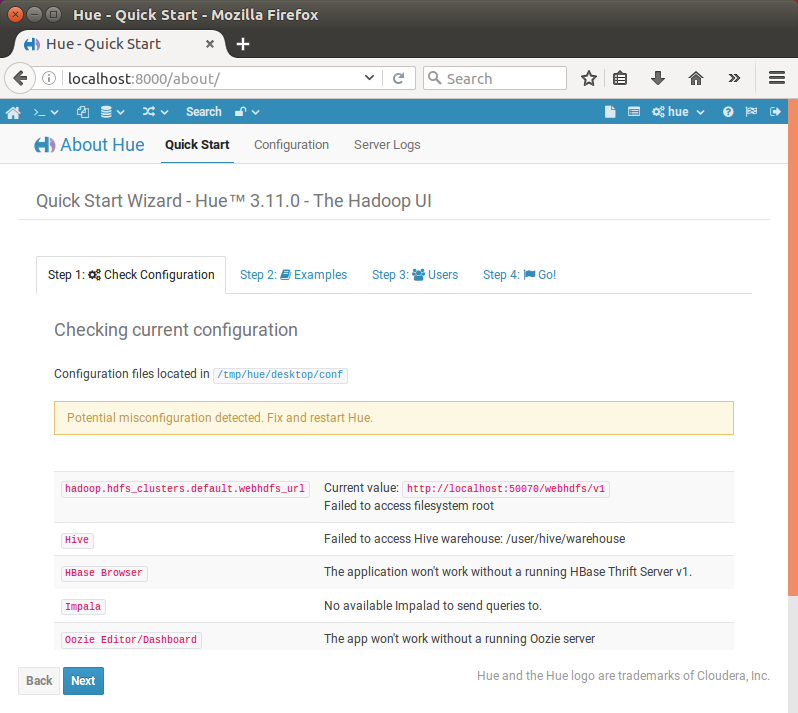 Here is how to install Hue on Ubuntu 16.04 running Hadoop. Hue consists of web service which runs on a node in cluster. Hue has editors for Hive, Impala, Pig, MapReduce, Spark and any SQL like MySQL, Oracle, SparkSQL, Solr SQL, Phoenix etc. Dashboards to dynamically interact and visualize data with Solr or SQL. Scheduler of jobs and workflows. Browsers for Jobs, HDFS, S3 files, SQL Tables, Indexes, Git files, Sentry permissions, Sqoop etc. Some related thing to know is that – we can accessing HBase by using the HBase Shell. We can start HBase Shell with hbase shell command. Django version 1.6.10, using settings 'desktop.settings' Starting development server at http://127.0.0.1:8000/ Quit the server with CONTROL-C.
Obviously, if you point to http://127.0.0.1:8000/ you’ll get the GUI. Stop the server after testing. As from Cloudera’s documentation, if you place your Hue Server outside the Hadoop cluster, you can run an HttpFS server to provide Hue access to HDFS. The HttpFS service requires only one port to be opened to the cluster. Cite this article as: Abhishek Ghosh, "How To Install Hue on Ubuntu 16.04," in The Customize Windows, October 7, 2017, April 21, 2019, https://thecustomizewindows.com/2017/10/how-to-install-hue-on-ubuntu-16-04/.